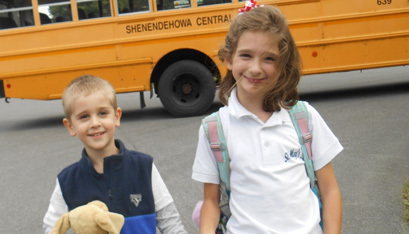 A happy St. Mary's Ballston Spa student exits the bus with her brother, who will attend St. Mary's Pre-K in the fall. As we approach Catholic Schools Week, I want to personally thank the educators and the principal at our Catholic School, St. Mary’s in Ballston Spa. My daughter is quiet and reserved and when it was time to send her to kindergarten, I was concerned that she would fall through the cracks at public school. My husband suggested that we send her to a Catholic school where she would not only receive the individual attention that she deserves but also grow in her Catholic faith. We selected St. Mary’s School, the “small school with a big heart,” and we couldn’t be happier with our choice. The teachers at St. Mary’s show a genuine interest in each child’s spiritual and academic development. They appreciate the uniqueness of each child and encourage each child’s God-given talents and gifts to flourish. My daughter loves to read and to express herself creatively through writing and art. St. Mary’s placed our daughter in a rich literary program where she can express herself creatively as well as excel academically, socially and spiritually. I can personally recount many instances when the teachers showed kindness to my daughter when she needed it. One night, I dropped her off at the Kids’ Night Out School Halloween party and, upon not seeing her friends right away, my daughter stayed by the front door, hesitant to enter the school. My family feels truly blessed to send our children to St. Mary’s School. I would encourage parents in the Diocese to call your local Catholic school and ask for a tour. The dream of having a child who wakes up on a Monday morning excited to go to school, isn’t a dream at all. It’s a reality for us at our Catholic school. Jennifer VanDeCarr is a parish­ioner at St. Mary’s in Ballston Spa.